THE MANTA SERIES brings Osprey’s Hydraulics™ solutions to a multisport pack. 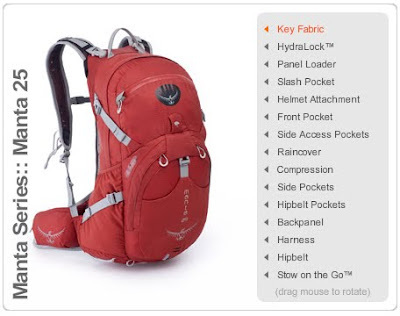 Utilizing our HydraLock™ system, these packs offer great features for adventure oriented pursuits. Osprey carry and torso-specific fit help you focus on the adventure and not on what’s on your back. 1. easier use of the bladder sleeve with a full pack. 3. hip belt pockets that you could zip closed with one hand. They nailed the first 2 – 2 out of 3 is enough to send me to the store. Initial impressions: the hydration bladder is genius. Will never bulge against my spine no matter how full. Won’t drop to bottom of pack when empty. Should be easy to get in and out of the pack. Note to Talon users: the bladder can be bought separately and used in the Talon. At 10 5/8 ounces it’s heavy. The tube is larger diameter than camelback meaning the filter attachments need some creative fixin to get working. My Manta 20 weighs in at 2lb5.5 oz on my scale without the bladder. From that I would infer weights listed on the website do not include the bladder.